On Thursday September 24th in Washington, DC, Richard D. Heideman was honored for his outstanding professional and philanthropic achievements and their impact on society by the George Washington University as a recipient of the 2015 Distinguished Alumni Achievement Award. Some people are self-made men and women. I am not a self-made person, but rather am a proud product of loving parents and grandparents who always encouraged me in every aspect of my life. And, I am a product of a precious loving and supportive wife, Phyllis, who with our three wonderful daughters, Stefanie, Elana and Ariana have always stood by my side as together we have walked long paths in always standing up and speaking out for what we believe and in sharing our mutual love and support, for which I am forever grateful and proud. I am indeed fortunate to have been the beneficiary of an outstanding education: in High School in Detroit, at the University of Michigan, at GW Law School and the Hebrew University Faculty of Law in Jerusalem. Lessons learned, both in and outside the classroom, are essential tools for success. I am so very fortunate to have received leadership training as a youth leader in the B’nai B’rith Youth Organization and to have had the privilege of serving both as International President of that organization and of B’nai B’rith International itself. Special friends in life help make each of us better people. Caring. Sharing. Enjoying. Counting on one another helps to round out life’s moments – both in sad and in happy times. We are blessed to have friends with whom we have grown and to whom we are so very appreciative for their support and constant encouragement. Two special GW friends to whom I would like to pay tribute are former GW President Steve Trachtenberg and former GW Law Dean Fred Lawrence. Life’s memories and lessons are important ingredients in making each of us better people. I well recall my father advising me to always strive to be the best I could be; and my grandmother telling me to always remember that in the end of our days all we take with us is our good name. What distinguishes a person, I believe, is who they are; what they do with the gifts which G-d has given them; and what they stand for. In doing the work that I and my law partners, Noel and Tracy, with our legal assistant, Keyauna, and Phyllis as our administrator, do on behalf of American Victims of Terror, we have been given the opportunity to demonstrate who we are, what we do and what we stand for. We are committed to seeking justice for and giving voice to those who have been killed and maimed, whose lives and families have been torn asunder, and to do for our clients everything possible to hold sponsors of terror legally accountable. I am honored to receive this Distinguished Alumni Achievement Award from George Washington University not for myself but on behalf of all of those in my life who have loved me, supported me, educated me, trained me and given me the opportunity to help make a difference as we strive to make this world a better place for humankind. 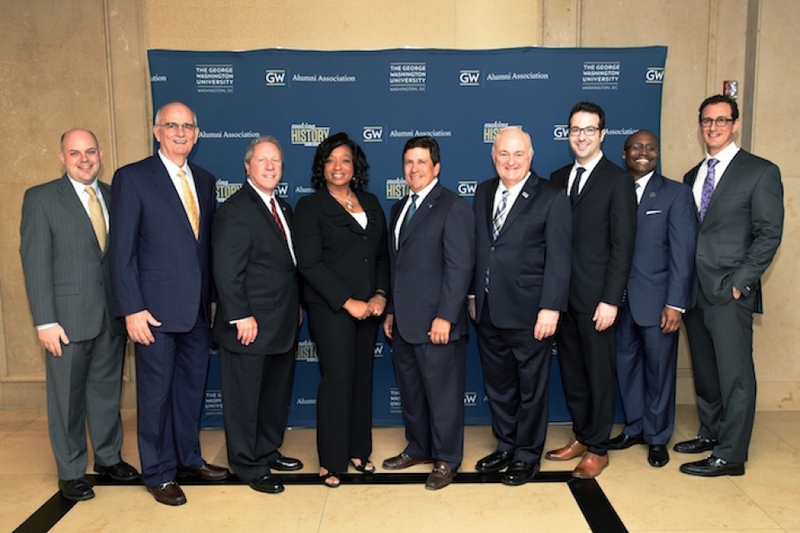 From left: GWAA President Jeremy Gosbee, Gregory Williams, Richard Heideman, Christyl Johnson, GW Board of Trustees Chair Nelson Carbonell, Dr. Knapp, Jay Kaplan, GW Vice President for Development and Alumni Relations Aristide Collins Jr. and Elad Levy.